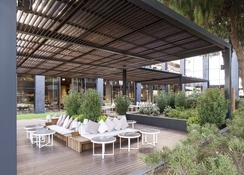 Enjoy stunning 5-star Turkish hospitality and services at the Voyage Belek Golf & Spa. 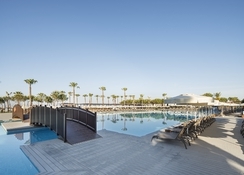 Perfect for families, couples and solo travellers looking for a lavish holiday, the hotel features 8 a la carte restaurants, 3 snack restaurants, a patisserie, 14 bars, a kids’ restaurant, 6 swimming pools, mini club, spa, gym and a galore of tailored recreational activities and facilities. The fun-filled aqua park comes with thrilling rides and separate pools designed for children and adults. The hotel offers a unique holiday experience, all thanks to its sparkling pools and the magnificent private beach with adult-only and family concepts. But that’s not it, Montgomerie Maxx Royal Golf Club, one of the stunning golf courses of the Mediterranean coast, stands out as the centre of attraction for the golf lovers. 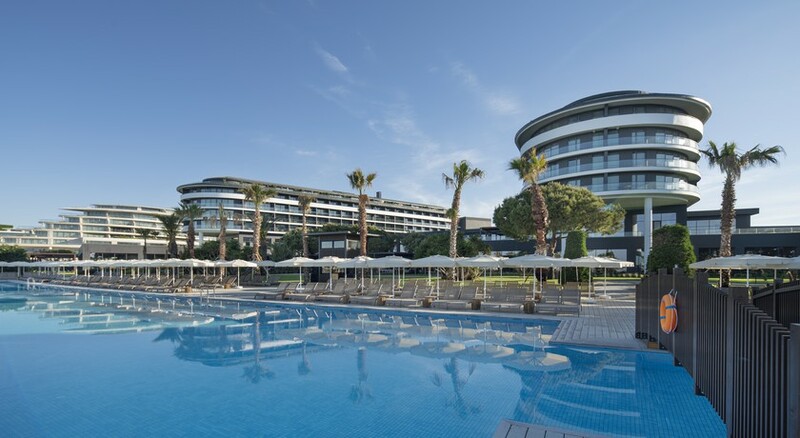 Voyage Belek Golf & Spa is a 5-star hotel nestled on the stunning shores of the Mediterranean Sea, in Belek. The nearest town is about 2 km from the hotel, though Antalya is the largest commercial town, about 45 km away. You’ll also find restaurants, cafes, supermarkets and shops just a few minutes away from the hotel. The nearest airport is Antalya Airport, 35 km away from the hotel. Voyage Belek Golf & Spa houses 11 types of rooms, broadly divided into Bungalows, Standard Rooms, Family Rooms, Deluxe Rooms and Suites. 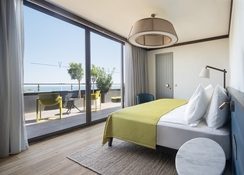 Rooms are chic and beautiful, carefully customised with facilities such as air conditioning, electric kettle, digital safe deposit, en-suite with complete bath amenities, hairdryer, telephone, TV with satellite and more. 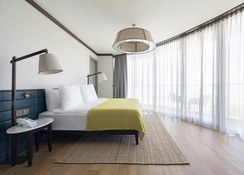 Most of the rooms can accommodate between four and six guests, and bedding option completely depends on availability. 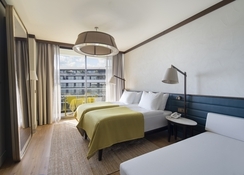 Features such as extra bed and room service are available only on request, and upgraded rooms come with extra amenities. 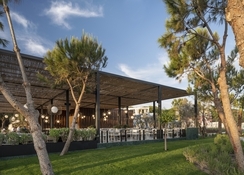 Offering a luxurious gastronomical experience, Voyage Belek Golf & Spa features 2 multi-cuisine restaurants, 8 a la carte restaurants, 3 snack restaurants, 14 bars, 1 patisserie and 1 kid’s restaurant. The buffet restaurants serve serves mainly all the international cuisine for breakfast, lunch and dinner. As for bars and lounge, the hotel features a Lobby Bar, which is open 24/7, Adult Pool Bar, a Family Pool Bar, Patisserie Bar, Beer House, Laguna Bar Planet Bar and more. The hotel features 5 swimming pools and one adults-only pool spread across the complex—one with waterslides. There are loungers and parasols around the pools, along with 12 pavilions and two piers. You will find multiple bars around the pools to wet your vessel after swimming in the evening. The private beach with both adult-only and family concepts is a perfect place to soak up sunshine, while the fun aqua park provides exhilarating entertainment for all age groups. If you’re in a mood to pamper yourself, do visit the signature wellness centre that offers services such as luxurious massage rooms, hammam, sauna, relaxation loungers, gym and more. Activities such as badminton, archery, mini football, mini golf, tennis, aerobics, darts, beach volleyball, bowling, water sports, table games and billiard are popular games among guests. And if you go to the beach, you’ll find catamaran, banana, jet ski, wind surfing, ringo, parasailing and more. There are multiple animation and entertainments throughout day and night, including kid’s animation and activities, recreation room, playground and video games room. Children between the ages of 4 and 12 years can also join the mini club.